The first Polish service which uses advantages of crowdsourcing for performing micro tasks e.g. market research. With your assistance we want to create a truly global company. 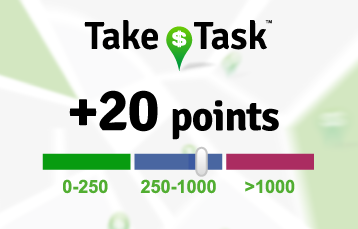 TakeTask - “Uber” of micro tasks market. We are one of the few Polish applications using crowdsourcing. We support social activities and connect the company with users through small tasks such as market research, audits and micro services in exchange for remuneration. Thanks to the community of thousands of registered users we enable quick implementation of projects throughout the whole country. 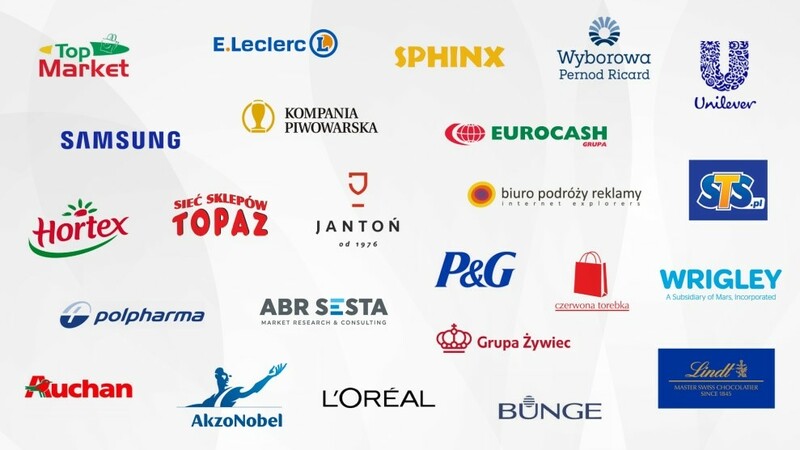 We have gained trust of biggest Polish and foreign brands which in 2016 commissioned more than 16.000 tasks with the help of our application. Speed - completing national projects even within a few hours. Community - our users are located all over Poland ensuring access to data from both small and big cities. Saving - Projects implemented with TakeTask are less expensive compared with traditional methods of their completion. 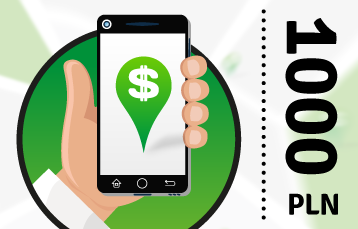 Credibility - We take care of data verification using photographic documentation, GPS location data or a double-check system controlling effects of users’ work. Profits - TakeTask is a source of an additional income which can be earned during someone’s free time and which is not time-consuming. 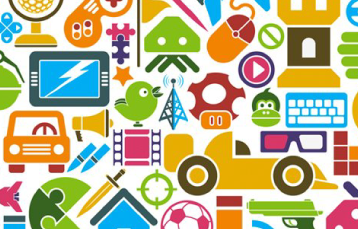 Gamification - We ensure constant satisfaction and involvement of our users owing to a well-thought out and attractive system of advancement levels. Fun - TakeTask is not just a paid job, we complete a number of additional challenges and competitions. 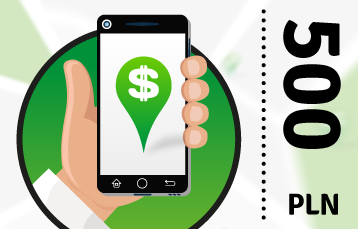 Companies outsource paid tasks which are implemented by the community of several thousand TakeTask agents. Our users are Agents ... secret Agents. While performing tasks they can become promoted in the hierarchy, receiving not only payment but also experience points. Thanks to that they have access to additional privileges and benefits. This is the beginning of the reputation system, which is going to be strongly developed together with the development of the application. Companies use TakeTask as a mobile tool for commissioning and reporting performance of tasks within the organization. The story of TakeTask has the “Secret Agent” style. Users are Agents who receive tasks from the headquarters. They get financial gratification for performing them as well as experience points. 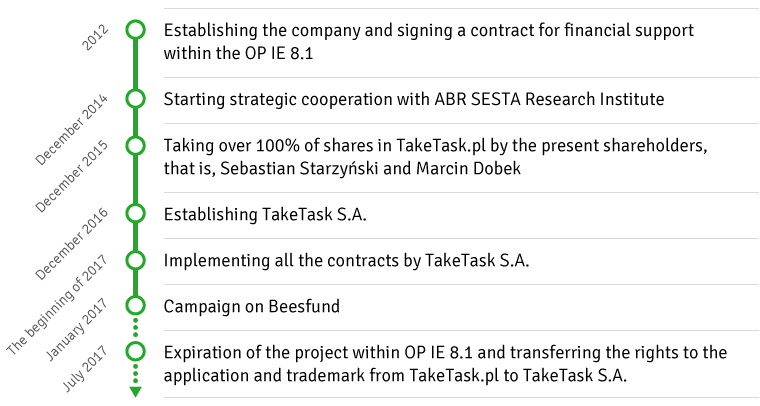 Thanks to them they can obtain the following ranks which are associated with additional privileges e.g. wider range of visible tasks. This is the beginning of the reputation system, which is going to be strongly developed together with the development of the application. - says Teodor Sobczak, Member of Supervisory Board of TakeTask S.A.
TakeTask is responding to those needs! Reducing the cost of projects also helps to create the size of the market by including entities for whom traditional methods were too expensive so far. This indicates very good prospects for the development of the project and the entire sector of micro tasks. 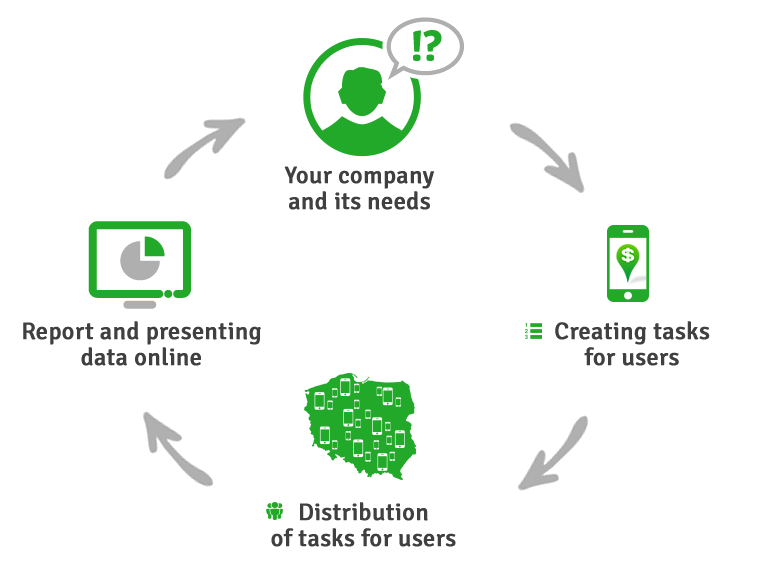 TakeTask is a good example of collaborative economy, that is, a new social and economic phenomenon, and it can become something like a Polish Uber. 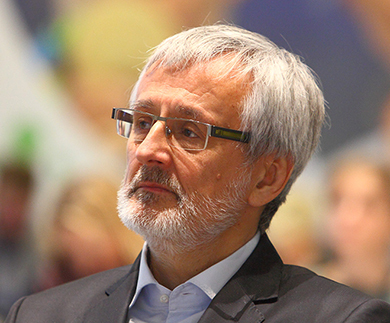 - predicts prof. Boleslaw Rok, Member of Supervisory Board of TakeTask S.A.
Progressive and sustainable development of this trend can be observed through the research such as the report of Collaborative Economy in Poland in 2016. Basic information about company’s activity. 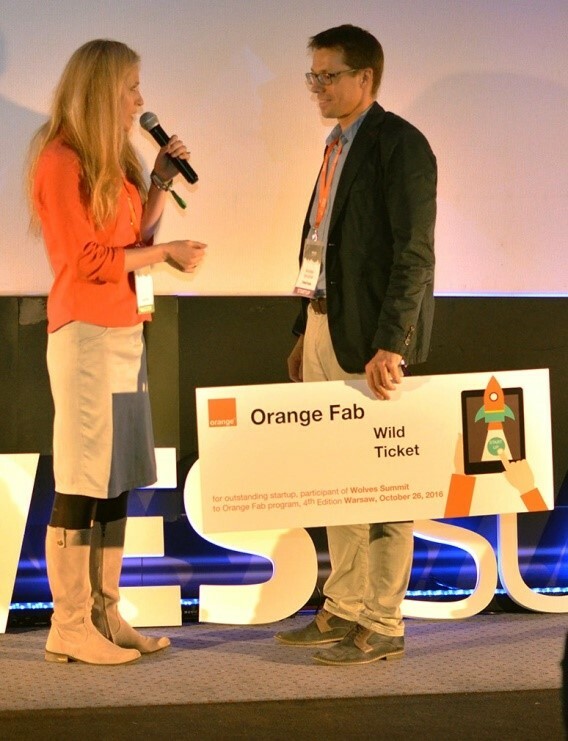 Wolves Summit conference (October 2016) – we were the best promising start-up out of 350 competitors to cooperate with Orange. Owing to the capital obtained from the current public issue of shares, TakeTask is going to offer a lot more than market research and is going to start its global expansion. Additionally, we are going to develop gamification and reputation systems, as well as conversational interfaces for better user experience. In the longer term, we want to enable outsourcing of tasks by individuals (e.g. repairing a computer, mowing a lawn). We want to be a truly international company and have an international valuation. This will have a clearly positive impact not only on the value of TakeTask S.A. shares but also on increased profitability and competitiveness, as part of the operating costs will stay in Poland. Therefore, we want to perform development and sales activities which will enable us to enter European markets and in the long term – the global ones. One of the key factors to success, and thus increased value of the company, is to maintain high sales growth. We have a well prepared and reliable strategy of using the CRM tools and sales automation. This will allow us to acquire foreign customers in a quick and efficient manner. Thanks to that we are able to complete projects for our customers in a quicker way. Therefore, we are going to conduct activities aimed at the construction and activation of users in foreign markets. We have been already discussing entering into partnerships with entities that manage communities in different countries. The first results are satisfactory – the companies we have selected expressed interest in such cooperation. Become a shareholder of a company which grows following the global trend of collaborative economy. Become a part of an initiative that uses the power and innovation of crowdsourcing for projects previously reserved for the biggest players. TakeTask is not only a great application or an experienced team standing behind it but also thousands of users involved in building an active and informed community. Join us now! 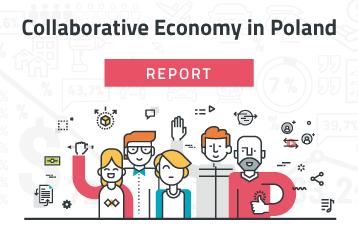 Collaborative Economy Report with a bonus industry part. Extra 100 experience points in the application (equivalent of performing 10 tasks). If you buy a package of minimum 20 shares, you are going to receive a 20 000 mAh Powerbank which will allow you to perform more tasks in the field on one charge only. 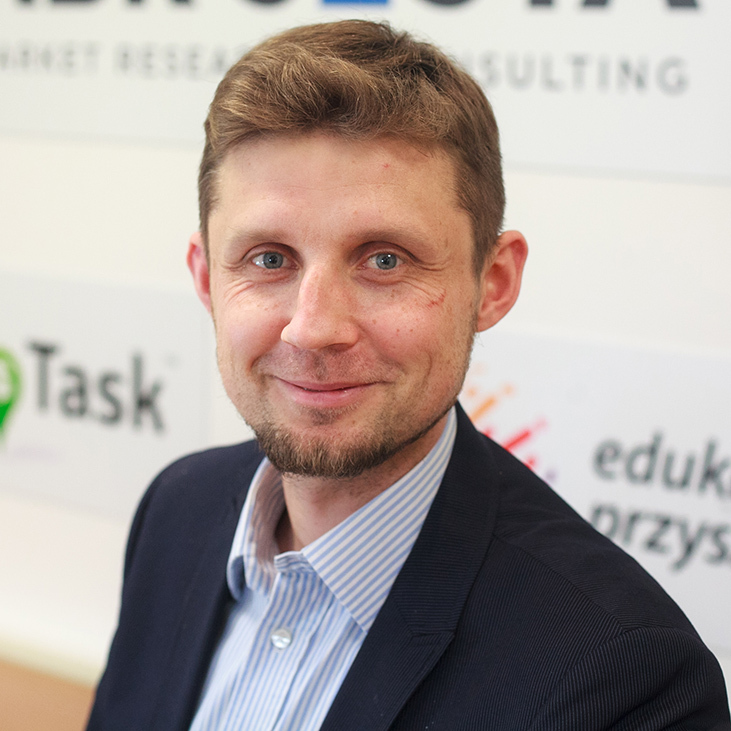 Participation in the training on gamification and Collaborative Economy conducted by Sebastian Starzyński. 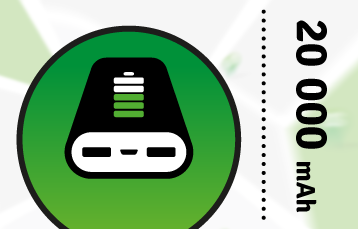 Possibility of implementing a project worth PLN 500 free of charge. Possibility of implementing a project worth PLN 1000 free of charge. Currently, there are two main shareholders engaged in the project, as well as a person responsible for coordination of projects and community management. The project is operated by a team of IT specialists. The Supervisory Board, which consists of highly specialised experts, provides us with their substantial knowledge. A manager with 20 years of experience. Member - Polish Society for Opinion and Marketing Research (PTBRiO) and World association for market, social and opinion research (ESOMAR). 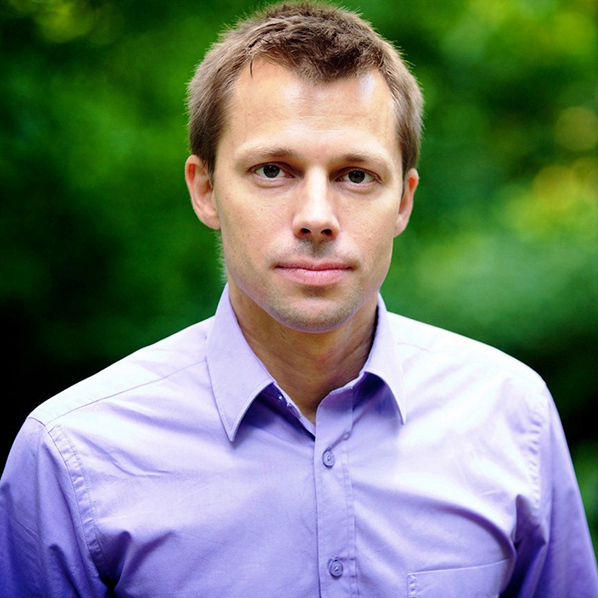 An expert in the field of gamification and collaborative economy (among others, he was the co-author of the report on Collaborative Economy in Poland in 2016), futurist and a frequent speaker at business conferences. A Graduate of the Warsaw School of Economics with an MA degree. A manager with 19 years of experience. Grupa Casino (Geant Poland and Geant France) - a manager of the Category Management and Trade Marketing / Purchaser/ Project Manager/ Coordinator of Private Labels. Member - Polish Evaluation Society (PTE) and Polish Society for Opinion and Marketing Research (PTBRiO). An expert in the field of innovation and evaluation. 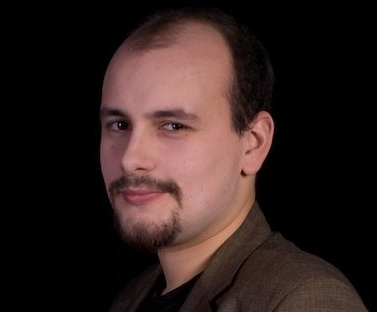 A graduate of the Warsaw School of Economics (PhD), ESSEC Paris Business School (post-graduate studies), a graduate of the Warsaw University of Life Sciences with an MA degree. He deals with issues connected with ethics and corporate responsibility, collaborative economy and circular economy, compliance and sustainable development. 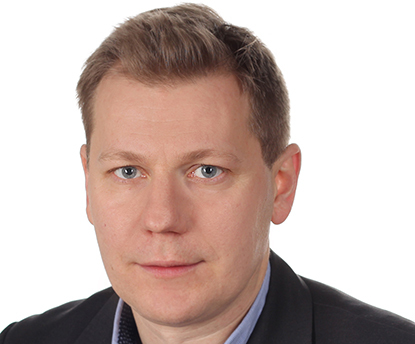 A co-author of the annual Responsible Companies Ranking for Dziennik Gazeta Prawna. Involved in the creation of modern educational tools, educational games and the development of training methods. An experienced coach of soft and social skills. A graduate of the Warsaw University. A manager with 15 years of experience in managing large teams. Ministry of Foreign Affairs - promotion of the presence. He has several years of experience in the use of various CRM systems in the following industries: insurance, finance, telecommunications, media and sales, both B2C and B2B. An experienced coach, with passion for new technologies and programming. He graduated from the Faculty of Journalism and Political Science of the Warsaw University and Postgraduate Studies at the Faculty of International Relations. 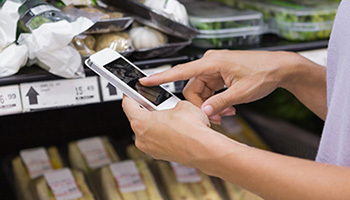 TakeTask S.A. has established a strategic cooperation with ABR SESTA – research institute set up in 1996 as a company specialised in conducting retail audits and shopper behaviour studies. 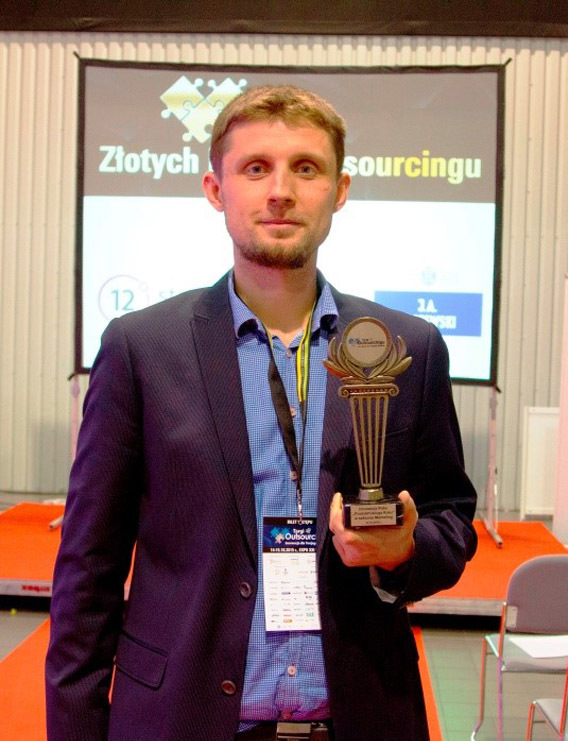 Since 2016 it has been an exclusive Polish partner of Information Resources Inc., one of the biggest research and Big Data agencies in the world. Owing to that, TakeTask has access to the nearly 50-person team of ABR SESTA specialists, including senior analytical and coordination staff, as well as sales and IT support. It is particularly important due to cost flexibility and the possibility of undertaking extensive projects without the need of employing a big team permanently. If the number of projects increases and it becomes economically justified, TakeTask will develop its own team of analysts. WHERE DOES THE SHARE VALUE COME FROM? For such a technical question we have a technical answer. The company's valuation was performed using the income method based on the residual value determined at the end of the investment period. The residual value was estimated on the basis of a detailed financial model included in the company's business plan, where the basis for the valuation was the version of a prudent business plan (i.e. a conservative version). A multiplier of a residual value has been chosen based on the market references for high-technology companies which have a significant capability to scale their business. CAN I REALLY MAKE MONEY ON THAT? We believe that you can, which has been proven by funds invested in the company and the involvement of its current shareholders. The funds from issuing shares are going to be allocated for an expansion into new markets. It is worth buying even a few shares counting on a significant increase of their value in the future. Moreover, you can also contribute to the growth of share value by recommending our service to others. CAN I SELL MY SHARES TO ANYBODY ELSE? Yes, you can. Shares are securities and according to the law, you can resell them further in your sole discretion and their valuation. The sale of shares does not require a notarial act but it is necessary to inform the company of this fact and to make changes in the list of shareholders. It is also recommended to inform other shareholders at what price and how many shares you sold or purchased. As major shareholders on behalf of all shareholder, we are considering two exit strategies which we would like to implement within 4-6 years. The first one involves floatation on the stock market whereas the second one assumes selling all the shares to a strategic investor. DOES THE POSSESSION OF SHARES BIND ME TO ANY OBLIGATIONS? Owning shares does not involve any obligations. Once a year, you will receive our invitation to the General Meeting of Shareholders. You can accept it or not. However, we encourage all shareholders to promote TakeTask services in their working environment and among friends because in this way we can very quickly increase the number of customers and thus increase the value of the company. IS SUCH AN ACTION LEGAL? Yes, it is. We have been cooperating with Beesfund.com which already has experience in similar actions and a law firm which takes care of formal issues. It is important to remember that this action has been reported to the Financial Supervision Authority. DO YOU INTEND TO PAY A DIVIDEND? Not for the moment. Our ultimate goal is to develop our application and expand sales and therefore we want to allocate our profits for further investments. This will have a beneficial effect on the market opportunities of the company and the valuation of the shares in the future. HAS ANYBODY ALREADY DONE IT? Some companies in our industry have already gained investors but to our knowledge we are the first company which is building a community of investors. This gives us an advantage because we gain not only capital but also a large group of ambassadors. WHAT IF YOU DON’T MANAGE TO OBTAIN NECESSARY FUNDS? The flexible model we have chosen enables the issuance of purchased shares even if the main aim of the campaign has not been achieved (400 000 PLN). In 2017 we are planning to raise capital from a number of sources beyond the public issue of shares. We are in talks with several individual investors (including funds). We are going to participate in few accelerators because our services are applicable in many industries. We also intend to apply for financial support from the EU. Overall, we need a capital of around 1 000 000 PLN, therefore we have already planned to obtain it from various sources, bearing in mind the fact that the issue of shares might bring us less than the expected amount of 400 000 PLN. WHY ARE THERE SO MANY TAKETASK COMPANIES? Our first company was TakeTask.pl sp. z o.o. It obtained EU funds and launched TakeTask service. In 2015 Sebastian Starzyński and Marcin Dobek, together with the shareholders from the above mentioned company, established cooperation which was to commercialise TakeTask project. In order to do that, they set up TakeTask sp. z o.o. (a management company) and TakeTask sp z o.o. sp. k. (an operating company). 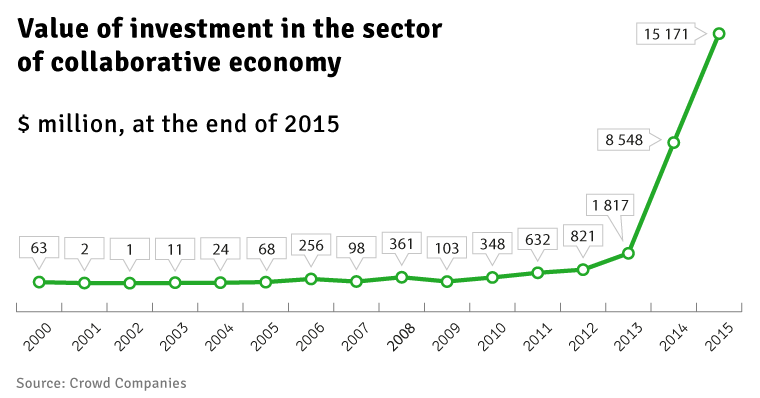 In December 2015, Sebastian Starzyński and Marcin Dobek bought the shares of all companies from the remaining shareholders. In December 2016 they created TakeTask S.A., which from January 2017 takes over all the projects previously conducted by TakeTask Sp. z o.o. sp. k. By the end of 2017, TakeTask.pl sp. z o.o., TakeTask sp. z o.o. and TakeTask Sp. z o.o. sp. k. will cease their activity, will be sold (before that all intangible assets will be transferred to TakeTask S.A. ) or they will change the profile of their operation. WHO HAS THE RIGHTS TO THE PLATFORM AND TAKETASK TRADEMARK? TakeTask.pl Sp. z o.o. holds the rights to the platform and all the TakeTask trademarks. These rights shall stay within the company till mid- 2017 due to the so-called “period of project durability”, meaning the time when the company must not sell any intangible assets subsidised from EU funds. Otherwise, the company would have to pay back all the funds which it has received. In mid- 2017 the project is going to be settled and all the rights to the platform and trademark will be transferred to TakeTask S.A. Currently, TakeTask S.A. uses the exclusive license for the platform and trademark with the priority to purchase all the rights. The agreement also guarantees the possibility of software modifications. Summing up, all the development of the application is performed by TakeTask S.A. from the beginning of the year. WHAT MAKES TAKETASK DIFFERENT THAN COMPETITORS? WHEN WILL THE APP APPEAR IN OTHER STORES (E.G. APPSTORE)? Creating iOS version is a natural stage of the development, especially taking into account our plans for an international expansion. We have not done it so far due to financial reasons. First, we would like to make necessary changes to the application for Android and after that we intend to create an iOS version. This, however, depends on acquiring additional capital from individual investors beyond the current issue of shares. We assume that by the end of 2017 we will have made the first version of iOS available. At the moment we do not intend to create any other platforms.